Wobble your way to better health! 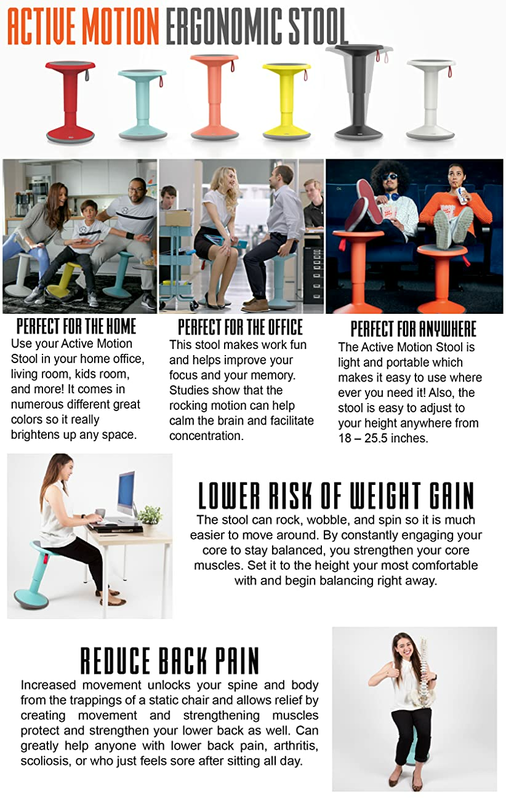 Stand Steady's Active Motion Stool is an innovative product that engages your core and keeps your body moving. Compared to a regular office chair, a wobble seat can increase calorie burn, help improve focus, while also providing relief for your legs and feet. The whimsical design and eye catching choice of colors add a little fun to your workday, while the adjustable height of this premium wobble stool lets you achieve the perfect fit. Behold, the ubiquitous office chair...stark, stagnant, sad. Why not bring a little color and healthy movement into your work life? Why not promote well-being, creativity, and enjoyment? After all, life is too short for boring furniture! The unique design of Stand Steady's active sitting chair is both attractive and functional, allowing you to sit still, or swivel and sway to your heart's content. The wobble base is non-marking and grips the floor for stability, while the feather weight and teeny tiny footprint makes the wobble stool easy to stash when you're not using it. The Active Motion Stool by Stand Steady is also perfect for home! Use it as a computer chair, guitar chair, sewing chair, or as kids chairs. This wobble seat is available in a range of five super fun colors: Black/Gray, Red, Coral, Teal, White, and Yellow. It's perfect for any existing desk, cube, or table, and complements all of STAND STEADY’s standing desks and ergonomic office products. ERGONOMIC: This wobble seat promotes better spine alignment, helping you stave off back and neck pain. PREMIUM MATERIALS: The sturdy outer surface of this wobble stool is built for the long haul, yet the plush gray inlay makes sitting down extra comfortable. FOR WORK & HOME: A wobble stool is sure to add fun to your office! Its compact design also makes one handy in the kitchen, living room, family room, or anywhere else you need a comfy place to sit. STURDY & ADJUSTABLE: The pneumatic lift lets your adjust the height between 17.7" and 24.8", and supports any person up to 275 pounds. EYE POPPING COLORS: Available in Black, White, Teal, Coral, or Yellow. LIGHTWEIGHT: Weighing only 11 pounds, it's great for a dynamic and collaborative office where furniture often gets moved around. It's also nice for people who use an adjustable standing desk, because it's so easy to lift and store! If you want to take a sitting break, lower your standing desk, and just grab your Wobble Stool. PRODUCT WEIGHT: 9 lbs., 8 oz. At first, I was hesitant about the price, but it's worth every cent. This makes work bearable, and my back will thank me when I'm older. Very cool... only on it an hour but enjoying it and very good looking. I really like this for the primary reason I bought it:; to keep me moving while I am seated for long hours in front of my computer. I am over 65 and feel that I need the movement. I was a bit worried about whether or not I might fall off. No worries now. It does wobble, but I have never felt off balance. I did not give it 5 stars because, being over 65, I have less padding to sit on than I used to. The top is very firm. I think in years gone by that would not have been a problem. Now I am thinking of making myself a little cushion. Then it will be great. Also, I like the looks. Even though I have an antique office desk, the stool is elegant and minimal and looks good with it. This is the best chair EVER! Completely comfortable at every level. Wish it could get just a bit higher so I could use it to "rest" at my standing desk -- but other than that, it's FABULOUS!